Cream scones are a terrific baked good to have in your skillset. Unlike butter scones, which require the light touch of a great biscuit maker, these use heavy cream as the fat, making them super-fast to pull together. They bake in less than 15 minutes, and they can be sweet or savory, lending themselves to strong flavors like cheese, nuts or onion, or lighter ones like lemon or herbs. Once you have the basics down, the experimentation can begin. And there is nothing more inspiring for baking than cocktails. For this brunch-friendly scone, the Bloody Mary became the obvious choice for flavoring. 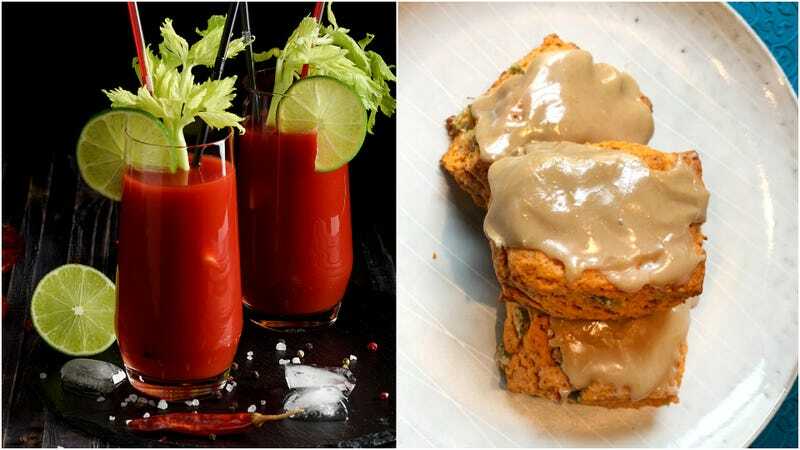 By incorporating tomato powder, horseradish, black pepper, and celery seed into the dough, adding little nuggets of candied celery, and finally topping with a lemon Worcestershire glaze, you get all the flavorful oomph of brunch’s best cocktail. They are great plain, or if you really want to up the ante, served with a smear of unsalted butter mixed with minced cornichon pickles and capers. Preheat oven to 375 degrees Fahrenheit and line a baking sheet with parchment paper. In a large mixing bowl, whisk flour, baking powder, salt, spices, tomato powder, horseradish, and sugar together. Stir in the candied celery if using. Make a well in the dry mixture and pour one cup cream in, and using your hand with your fingers held in a stiff rake-like shape, blend until barely combined. If the dough does not come together, add the additional cream one tablespoon at a time, kneading just enough to have a cohesive soft dough. Over-mixing will yield tough scones. Place the dough onto a lightly floured surface and knead briefly. Roll the dough to 1-inch thickness. Using a 1 1/2 inch- to 2-inch cookie cutter, cut out the scones for round scones, or just cut into squares the size you would like. Place them an inch apart on the lined baking sheet. Re-roll any scraps and cut until all the dough has been used. Bake for 12 to 15 minutes, or until golden. While they’re baking, make the glaze: Mix the lemon zest into the Worcestershire sauce. Add confectioner’s sugar and mix until well combined and smooth. Remove from sheet immediately and cool on a rack. While still warm, spoon about a teaspoon of glaze on each scone so that it covers the top and drips down the sides a bit. This is a recipe that was sort of an accidental by-product of making celery syrup for cocktails. But the slow-cooked celery bits are an unusual and fun ingredient for baking, and obviously the perfect thing for this cocktail-inspired scone! I’ve kept this pretty clean, flavor-wise, but the syrup lends itself to some spices, so don’t be afraid to toss in a cinnamon stick or some star anise, even mustard seed or juniper berries work great in this! More granulated sugar for dusting. Bring the water and sugar to a boil over medium-high heat and stir until the sugar is fully dissolved. Add the celery, and reduce the heat to low. Simmer, stirring occasionally for about 40-45 minutes until the celery is soft and a bit sticky. Remove the celery pieces from the syrup, draining well, and spread in an even layer on a sugar-dusted sheet of parchment paper, dusting again lightly with sugar on top, to let air dry a little bit before stirring into your scones. Reserve the syrup for use in cocktails. Any extra celery can either be stored in the syrup in the fridge or in an airtight container in the fridge for up to two weeks.